(1). A free shuttle serves the terminals at Roissy Charles de Gaulle (subject to availability). Information from the residence. (1). Open Monday to Friday from 16:30 to midnight. (3). Available every day from 7:00pm to 10:30pm. 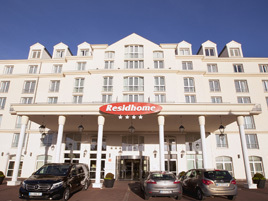 The Residhome Roissy Park serviced residence offers ready-to-live-in apartments and personalized hotel services in a warm and elegant setting. Near the Roissy-Charles de Gaulle international airport, the aparthotel is close to the Villepinte Exhibition Centre and Le Bourget. The residence offers easy access to Paris, and the nearby Parcs Astérix© or Disneyland® Paris. Open 24 hours a day, the serviced residence is made up of 275 apartments, ranging from studios to suites, including a living room, a fully-equipped kitchen (microwave, fridge, glass-ceramic cooktop, and dishwasher), a bathroom, an office area, and an LCD TV with cable and satellite. Many additional services, available for an extra charge, will make your stay a smooth one: breakfast, laundry facilities, parking, restaurant, bar, mini market, room service, Limousine private transfer, etc.